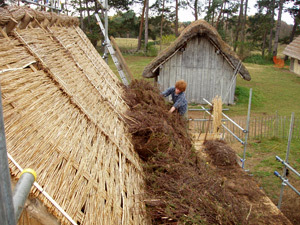 Thatching work to West Stow Anglo Saxon Village Museum in East Anglia. 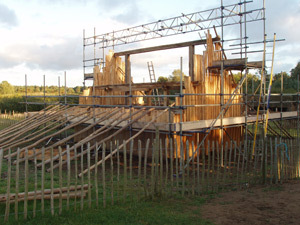 West stow is a reconstructed Anglo Saxon village in east Anglia and has been running for around thirty years. 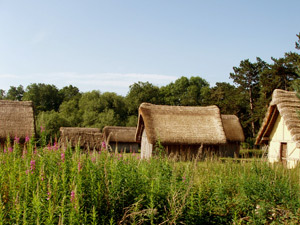 It has seven thatched timber buildings constructed over the excavated remains of the original structures found in an extensive archaeological dig. These structures have been re-constructed in a fashion thought to emulate the types of structures used around 1500 years ago in this area. Around five years ago I was asked to help bring the thatched roofs up to a standard befitting the abilities and skills of these highly capable early peoples. Each year I visit and rethatch a structure experimenting with different techniques and materials until all the structures have a new roof with all fixings and thatching varieties used researched, considered and debated by people like John Letts - archeobotanist from Oxford, Dr Jess Tipper the archaeologist in charge of the research and experimentation in the village and myself helping by making it all actually work. We don’t know exactly what methods where used this far back however with archaeology and research you can get a picture of how things where done and in the end there are only so many ways of getting thatch to stay on the roof and be waterproof! 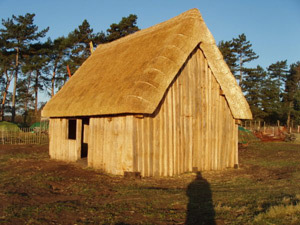 I find many reconstruction sites do a lovely job with the timber work, however fall down on the thatching often using imported water reed tied on with miles of bailing twine or at best tarred twine, this method also requires battens at regular spacing's to stitch the courses of thatch to. 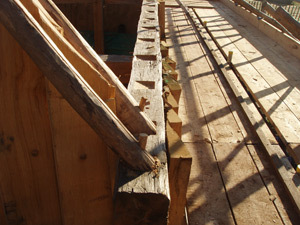 The battens themselves require cordage also to enable them to be tied to the rafters. I’ve been eager for years to emulate early thatching techniques and got my chance to put a whole roof on without modern fixings and further more without string! - this is roughly how it went.. The farmers house on site had unfortunately burnt down around six years ago and has now been lovingly rebuilt with hewn and riven green oak timbers and split boards fixed to the frame with oak pegs to keep the weather out. It was re-built by local woods people. Dafydd (my apprentice) and I then started to create a roof from Ash poles for rafters, setting them in to the wall plate in a way so they cannot slip and also then securing them with oak pegs. The joints I used can be made simply with tools available 1500 years ago and nowadays would be referred to as a construction joint as it is not dependant on just the fixings to hold it all in place. In east Anglia, fleeking was commonly used - the earliest examples dating to mediaeval times. This takes away the need for roofing battens which are a relatively modern concept anyway. 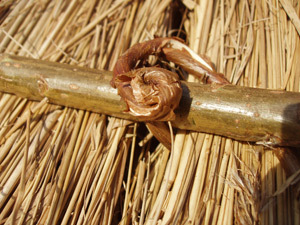 A woven mat of wetland water reed is applied in this case and is woven in situ into a matt as a layer to support a base coat of heather. This will stop it falling between the rafters and also helps in reducing the risk of fire hazard, so it serves as several functions - Primarily a support for the thatch and improved safety whilst reflecting more light in to the building. Aesthetics perhaps also played a part. 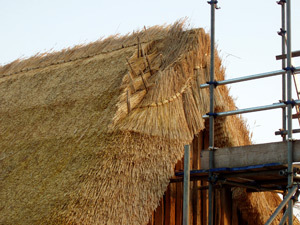 Most thatched roofs have two layers (or more) of thatch, A base coat layer of organic material, perhaps old wheat oats or barley straw, heather, bracken, gorse, turfs or whatever you’ve got handy. It is fixed over the whole roof in order to have something to attach a weathering coat (outer layer) to. The base coat is usually tied on to the timbers with straw rope but can be one of many different materials, bramble rope is an old favourite in early times as would be withy bonds, old mans beard and frankly anything not requiring too much manufacture. Hemp rope would be wasteful in the extreme as it requires considerable effort to plant, harvest and process etc. Simple binds are sufficient and were still being used up to recent times when it became possible to go to the farmers market for your string. 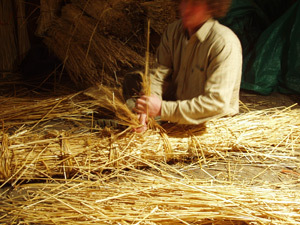 A horizontal willow rod is fixed to the outside of the base coat, stitched around the rafters with a withy bond, a knot called a rose is used, trapping sandwich like the heather base coat in place. 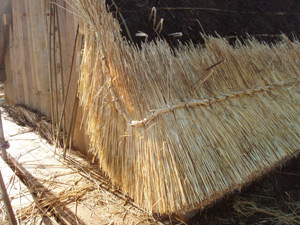 The base coat in place in this photo shows a layer of shoufe, a marsh grass / reed mix that was used in one area of the roof as a further experiment in the performance of different materials. 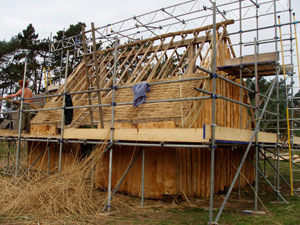 The first course being attached to the heather base coat with twisted straw rope made in situ held in place with hazel spars, this provides sufficient overhang to protect the walls from all but horizontal rain. 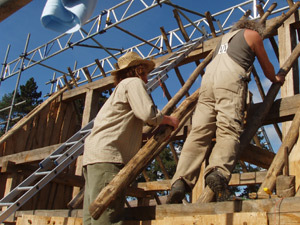 A roll of loose straw tied with straw bonds and laid along the top of the roof provides some pitch / grip for the spars that will later hold the ridge in place. 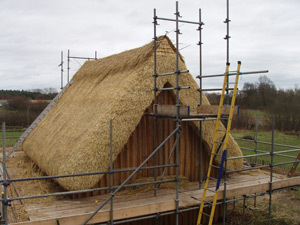 Here can be seen the courses of straw applied a little at a time until reaching the top of the roof when a ridge of some sort provides protection from the elements to the bond holding the last course in place. Turf ridges where once common, here I am using straw bent over the top held in place with willow horizontal sticks called ledgers and spars for fixing the ledgers in place. Straw rope ledgers were also very commonplace in the past. 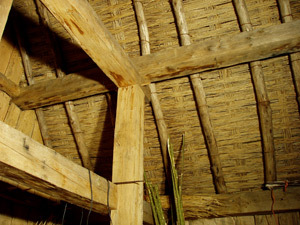 This shows the interior of the farmers house with the structure, rafters and fleeking clearly shown. The clean lines of this roof are testament to the finish you can easily achieve with the very simplest of early tools with all materials available to the people living in this village 1500 years ago. Hollywood 'dumbing down' has a lot to answer for!